While Apple has successfully rolled out the "notch" on 10s of millions of iPhone X handsets with OLED display, rumor has it that the company may be finding it a bit hard to carve the same kind of notch into a conventional LCD screen. Sketchy reports citing the Korean supply chain are claiming that the 2018 LCD-based iPhone might be delayed because of "light leakage" problems that LG is having problems solving. If the rumors are to be believed, if Apple wants to have the cheaper LCD screen sport the notch for design consistency, then they may need to wait until November for it. The report claims that the pair of OLED designs will be ready to go for a September announcement and late-September or early-October rollout. It's not clear how accurate the report is. Korean-language The Bell has no prediction history about the iPhone at all, and it appears to be basing the report on a solitary source inside Korea. As far as engineering goes, OLED screens can handle cutting and folding as a nature of the substrate. LCD screens can't, and generally must be rectangular. If this is even a problem, the obvious solution seems to be to not have a notch, and instead have a small "forehead" containing the sensors and speaker. 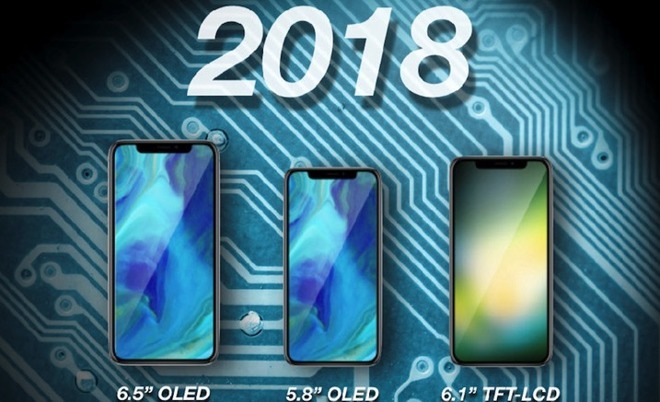 Apple is said to be doling out display orders for its next-generation iPhone lineup, which is rumored to include two OLED versions — 5.8 and 6.5 inches — and a cheaper 6.1-inch LCD variant. A wide variety of Android device manufacturers debuted phones with a notch to hold sensors at the 2018 Mobile World Congress, with the brand new Xiaomi Mi 8 a particularly egregious example.